That’s what a mama said to me the other day, while we were picking up the kids from the gym daycare. “Can’t afford it?” I asked back. “Expensive?” I echoed. I’m totally confused. I was super surprised by this. I’ve always been sensitive about people’s budgets, because – I get it. I’m a mom with a husband, baby, house, dog, cat, car…I know young families have financial obligations. I guess I’ve always had this thing inside me. If I want something badly enough, I find a way to make it work. Which is why I always work with my clients to create a personalized wall mural that is beautiful – and inspires imagination – with a budget that works for everyone. So this conversation got me thinking. Maybe I should show my clients ALL the ways that they can have the wall murals they want in a budget that suits them. So here are 4 tips (and a bonus one at the end) on how you can get that feature wall you’ve been dreaming about…without having to sell the farm! One way to stretch your MOOOO-la, is to create your feature wall with wallpaper murals. 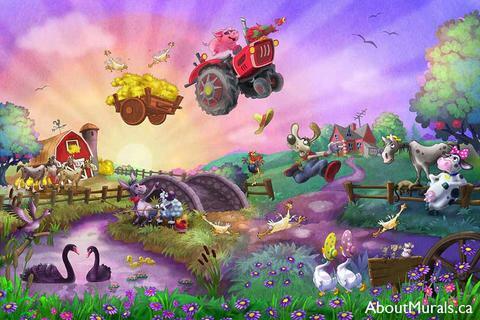 BTW, sorry in advance for all the farm sounds. First of all, I have a two-year-old, so my brain is wired to talk in animal. Second, I’m trying to stick to a farm theme in this article. I seem to be painting a load of boy’s wall murals these days. Farms and tractors seem like the perfect boys bedroom ideas to talk about (or playroom ideas too!). You get a complete wall – every square inch covered…every minute detail…every tiny brushstroke…a huge statement piece – starting from around a few hundred bucks. Do you know…to have me hand-paint a mural in the same size and in as much detail as these wallpaper murals ~ it would cost at least $2000! Plus, you’re still supporting artists who are amazing at their crafts ~ which makes YOU amazing too! I say to you…removable wallpaper. How bout you just grab a panel of your (already hung) wallpaper mural from the bottom of the wall and…gently pull up. All my wall murals with the SKU starting in “MU” are totally removable. In fact, once you easily peel it off, why don’t you roll it up and save it…because you can use it again! Yup. Take it to your new house. Give it to a friend with younger kids. Move it from the bedroom to the playroom. And it only takes 2 hours to hang them. Just follow my super simple instructions. Ya, another fun farm sound. 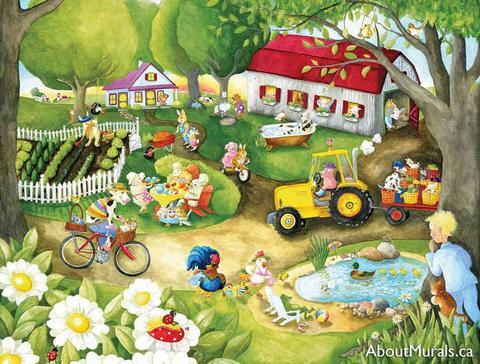 Maybe I should be writing and illustrating kids’ books instead of painting wall murals? So wallpaper murals aren’t your thing. But you don’t want the price tag of a Picasso. One way I’ve worked with clients on a budget is to have them paint their own mural background before I get there. Green grass. Blue sky. That sort of thing. 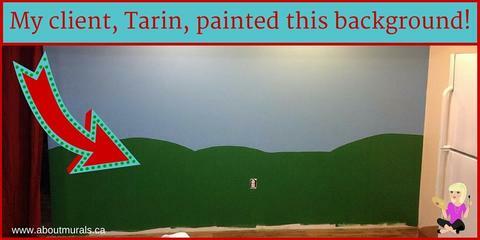 My client, Tarin, painted the blue sky and green grass for her farm theme playroom (actually, for her son’s farm theme playroom, but you get the point). She just used regular latex paint. I can even recommend paint colours for you, if you’re not comfortable picking out the colours yourself. She sent me photos as she progressed through the painting process, to get my feedback. It’s a fully interactive part of the mural process – I will help you through it step by step – with as much (or as little) input as you want. Here’s a great tip for painting backgrounds. It’s called the rule of thirds. Basically, it means don’t place your horizon line right in the middle of your canvas. Read more on the rule of thirds in this Wikipedia article. In Tarin’s case…don’t put the line where the grass and sky meet across the centre of the wall. 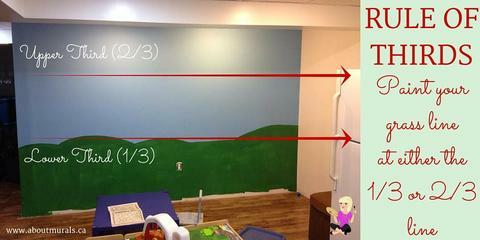 Imagine your wall is cut in 3…then place the grass line at either the 1/3 (lower third) or the 2/3 (upper third) area. She did an amazing job painting the background in latex paint and it saved her around $250 in labour. 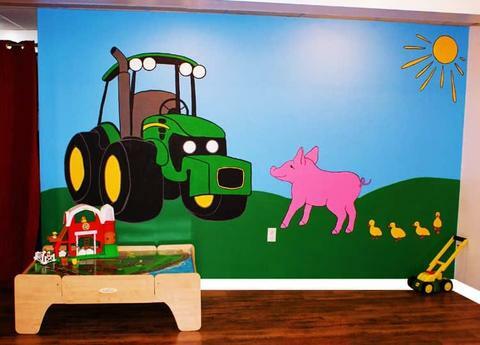 BTW, here’s the final farm mural I painted for Tarin’s little boy, Rhys. It’s in his playroom…fun! You aren’t sold on a mural scene, but you want a theme? Patterns are an amazing way to create a feature wall. 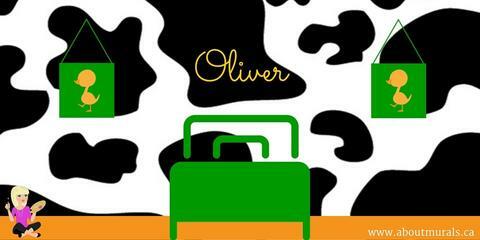 For a farm theme, why not have a cow pattern painted on your wall? I can even hand-paint your child’s name to personalize the mural. And because there is no intricate detail (other than the name), these types of wall murals are very inexpensive. Plus, if you’re the hands-on type, you can even paint the white background (in this example) to save you even more. I would just come in to paint the black cow pattern and the name. I try to run regular promos for my fans. Sometimes it’s on wallpaper murals. Sometimes it’s on my hand-painted wall murals (or other art). Sometimes it’s a contest. This isn’t really a “how to save on a mural” tip, but it is a way to make it possible if you want to go all out for that huge-tons-of-detail-cover-every-square-inch type of mural. 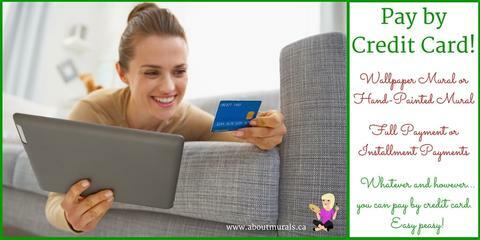 No matter the cost of your mural, you are always welcome to make installment payments. Sort of like layaway. Do it bi-weekly, monthly…whatever. You can even pay by credit card. 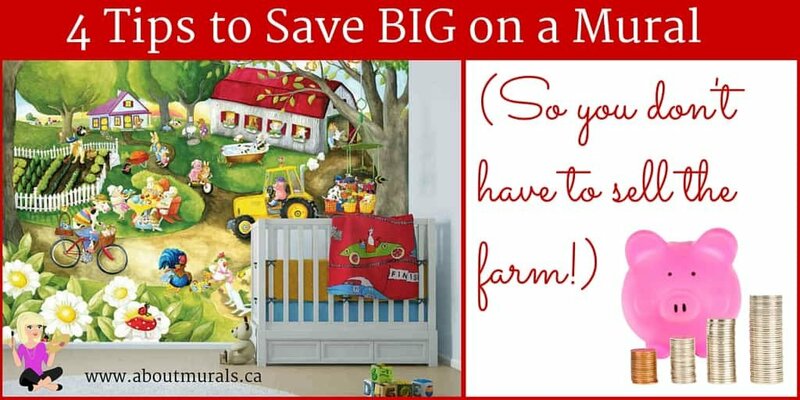 Can you think of any other ways to save on a mural? Have questions on how my pricing works? Feel free to share in the comments below!